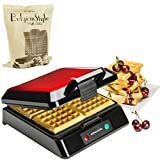 Andrew James Red 4 Slice Waffle Maker Whether you're tired of boring breakfasts of toast and cereal, or simply like to snack on something a little special, waffles are a tasty treat at any time of day. With the Andrew James 4 Slice Waffle Maker you can enjoy delicious freshly baked Belgian waffles at home. For breakfast, why not try waffles drizzled with golden syrup, strawberry jam, or chocolate spread. Or why not top with berries and whipped cream for an afternoon snack? In our Waffle Maker, waffles are baked to perfection and ready to eat in just a few minutes - and there's no end to the mouth-watering toppings you can experiment with! This traditionally designed waffle maker makes up to 4 waffles at a time, meaning it is ideal for families and handy for get-togethers with friends. The non-stick coated surface means the waffles are easy to remove and the machine can be easily cleaned ready for the next use. Appliance instructions and recipe suggestions are included, as well as a 1kg bag of Luxury Belgian Style Waffle Mix to get you started. Appliance instructions and recipe suggestions are included, as well as a 1kg bag of Luxury Belgian Style Waffle Mix to get you started.